What can I do, right now, to protect my information? To check if you were personally affected by the breach, you may visit Equifax’s website: www.equifaxsecurity2017.com. The best way to know that no one is using your personal information is to monitor your credit. We are recommending that Vermonters review their credit reports now, and regularly, to make sure that no unauthorized accounts are being reported. You can get a free credit report from each of the three credit reporting agencies annually, online, at www.annualcreditreport.com, or you can mail in a form. Concerned about protecting your minor children from identity theft? The Federal Trade Commission has excellent resources on child credit protection. Additionally, you may want to consider placing a security freeze on your credit reports. This is the most effective step you can take to block unauthorized use of your personal information. However, it does carry some costs and can create some minor difficulty if you need get a loan, credit card or other credit account. A security freeze does not affect your ability to use accounts that you have now. Find out more about freezing your credit files below and from the Federal Trade Commission. Who is Equifax? Why should I be concerned? Equifax is a consumer credit reporting agency. Equifax gathers and provides credit information based on an individual’s borrowing and bill-paying habits. Equifax suffered a major data security breach on July 29, 2017. 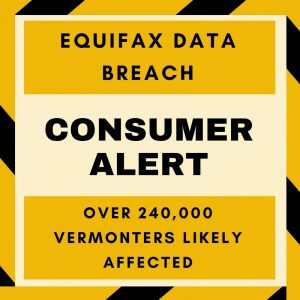 Over 240,000 Vermonters were potentially impacted and are vulnerable to identity theft. The information stolen includes names, Social Security numbers, birth dates, addresses and, in some instances, driver’s license numbers. In addition, credit card numbers and certain dispute documents with personal information were accessed. Equifax will be sending letters to all affected consumers. No waiver terms or binding arbitration will be imposed on consumers who go to the Equifax website to learn if they are affected. No waiver terms or binding arbitration will be imposed on consumers who enroll in the one year of free identity theft protection and credit file monitoring (“TrustedID”) being offered as a result of this breach. No waiver terms or binding arbitration will be imposed on consumers who request a credit report freeze as a result of this breach. You can contact the Attorney General’s office at 800-649-2424 or AGO.CAP@vermont.gov with further questions. A breach does not necessarily mean you are a victim of identity theft. A breach means you are now susceptible to identity theft. Identity theft is the unauthorized use of another person’s personal information to obtain credit, goods, services, money or property (for more information on Vermont laws regarding privacy and data security, click here). Identity theft may involve fraudulent use of credit card or bank account information. In some cases, your social security number and other personal information may be used to fraudulently obtain driver’s licenses, lines of credit, loans or other consumer accounts. I think I am a victim of identity theft. What steps should I take? Review your credit reports carefully for any unauthorized accounts. You can obtain your free credit report from each of the Credit Reporting Bureaus through AnnualCreditReport.com. If you find anything that should not be there, be sure to save a copy of the report. Then, contact the credit reporting agency to dispute all inaccurate items. Place a fraud alert or consider a freeze on your credit reports. Freezing your credit report could help prevent unauthorized creation of new accounts using your information. Freezing your credit report does not mean freezing your bank account, or that you won’t be able to use your credit card. You can find out more information from the Federal Trade Commission about fraud alerts and freezing your credit files. You’ll need to supply your name, address, date of birth, Social Security number and other personal information. Fees vary based on where you live, but commonly range from $5 to $10 to place a freeze. File an “identity theft” police report and ask for a copy for your records. Find your local police agency. Write down the name of anyone you talk to, what s/he told you, and the date of the conversation. Follow-up in writing with all contacts you’ve made about the ID theft on the phone or in person. Use certified mail, return receipt requested, for all correspondence regarding the theft. Keep copies of all correspondence or forms relating to the ID theft. Keep the originals of supporting documentation, like police reports and letters to and from creditors; send copies only. Keep old files even if you believe the problem is resolved. I still have questions, where can I find out more? Find out more about identity theft by visiting the Federal Trade Commission. You can also contact us at 800-649-2424 or AGO.CAP@vermont.gov. This entry was posted in Consumer by wbush. Bookmark the permalink.